Have you ever watched the show Undercover Boss? If you have, you know that business owners and CEO’s participate in the inner workings of their businesses, in disguise so that they get an accurate and unfiltered view of what people think and do. Jesus does something similar today in Luke 24 when he joins two of his followers on the road to Emmaus. Starting with yesterday’s reading, you will recall that we experienced Jesus’s crucifixion. While many people faithfully followed him there, there are two in particular that this story covers. After painfully witnessing his death these two patiently waited for further news. They both knew Jesus and trusted him. They spent enough time with him to easily recognize him. A few days after Jesus death, however, evidence was mounting that it was over. The time had come for them to re-engage in their old lives, reconnect with their families and get back to work. The hope that they so desperately followed was now a memory. Let’s go home, back to Emmaus. Walking side by side, the conversation is passionate. The two men cannot help but discuss what had happened over the last several days. About a month ago, This man, Jesus, promised them a better life, offering them freedom and hope. They dropped everything to follow him; the greatest man they had ever met. And now, he was gone. Upon hearing the news that his body was no longer in the grave, they were literally, “amazed” (Luke 24:22). This report was so shocking that they were dumfounded and bewildered with no idea how to respond. In fact, the prophecy found in Psalm 88:8 describes the events as “a horror” to them. This is where our story turns and Jesus enters as the Undercover Boss. Joining them in their walk, Jesus wanted to remain anonymous. So, he “kept their eyes from recognizing him” (v16). 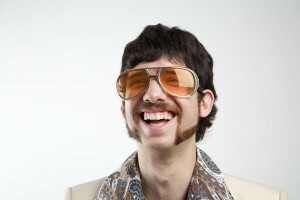 For what its worth, I have a picture of Jesus in my head with pork chop sideburns and fake teeth (kind of like this guy), but that’s not part of scripture’s description. Being undercover allows Jesus inside the conversation. He gets to hear their unfiltered accounting of past events as well as their thoughts about the future. What he discovers is disappointing. These two men were only focused on the past. They had quickly forgotten that the Scriptures promised more. My quick review of the prophecies clearly shows that “his chastisement brings us peace, we are healed because of his wounds, and that his death removes our iniquity, (Isaiah 53).” Surely, these men had this knowledge. But, they were anything but peaceful. They showed nothing of the freedom and healing that Jesus grants us. Instead, they lost hope (Luke 24:21). How does Jesus respond? Jesus leads them back to the Truth. He points to the promises of the scriptures and lovingly guides them back to himself. Not just who he was, but the discovery of his resurrection as his living self. This occurs with simple act of communion. Jesus took the bread and blessed and broke it and gave it to them. And their eyes were opened and they recognized him.” (Luke 24:30-31). If Jesus showed up in your life today as an Undercover Boss, what would he find? Do you display evidence of the hope and life he promises from his resurrection or are you still floundering with doubt like the two walking toward Emmaus?